Retro Recipe Redo is a new Quick Dish series that gives old recipe faves a mini makeover so they’re easier and quicker for today’s busy cooks. Lower the fat: Cut the butter down to 1/4 cup for the brown-sugar topping mixture if you really, really must. I looooove butter, so I kept it at the old-fashioned proportion, but (as much as I hate to admit it) the recipe works great either way. Flavor the water: Instead of plain water, use water plus juice from the pineapple can and maraschino cherries jar to add up to the same liquid measurement for the cake batter. 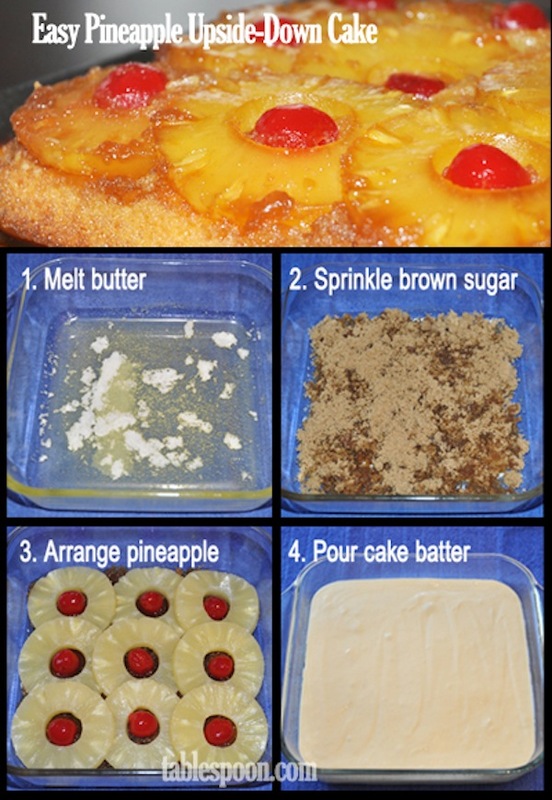 Add other fruit: Peaches or blueberries or other stuff work with (or instead of) the pineapple. Experiment! Oh, nuts! Sprinkle chopped pecans or walnuts over the brown sugar to add the crunch you love. Gluten free: Yep, there’s even an easy gluten free version that starts with a Betty Crocker gluten free cake mix. This entry was posted in Dessert, Recipes, Retro Recipes and tagged Recipes. Bookmark the permalink.